With the federal government shut down for the first time in 17 years, many of the nation’s weather forecasters remain at work, but longer-term climate research is taking a hit. According to Commerce Department documents, 6,601 of the 12,001 employees of the National Oceanic and Atmospheric Administration (NOAA)—or 55 percent of the agency's workforce—have been sent home without pay. That leaves 5,400 “excepted” from the shutdown, mainly because they are needed for the protection of life and property. 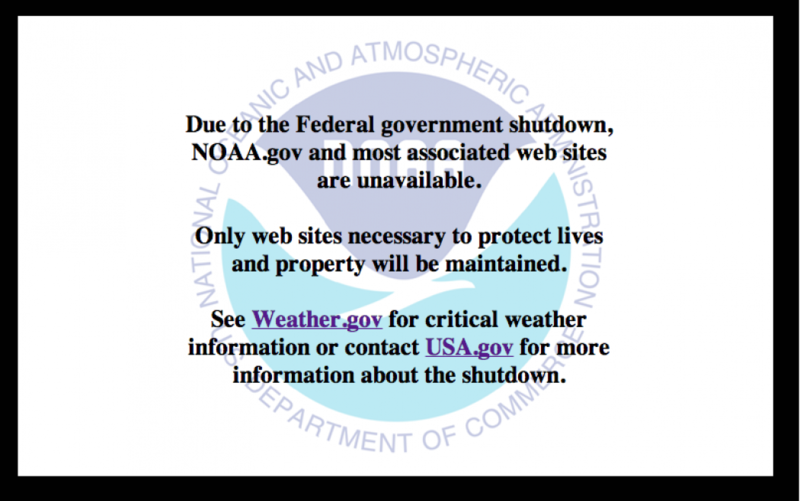 NOAA and NASA satellites will continue operating during the government shutdown, but the public may have trouble accessing images as websites are not maintained. In particular, the National Weather Service will continue operating its network of 122 local forecast offices to provide weather forecasts, watches, and warnings, and NOAA will also continue to operate its weather and climate computer models, as well as satellite data feeds to ensure that forecasters have uninterrupted access to weather information. But while the weather service forecast offices are open, employees are not allowed to engage in their typical full range of activities, according to a NWS meteorologist. “We are restricted to 'mission critical' duties. We aren't allowed to engage the public in outreach activities (such as spotter talks or school talks), and we're supposed to only include forecast-critical information on Facebook and Twitter accounts,” the meteorologist told Climate Central, speaking on the condition of anonymity because they were not authorized to talk to the media about the shutdown. “Only emergency equipment maintenance is allowed, which means that routine maintenance is not. This will hamstring us in the future, either when the shutdown is lifted and the rush of delayed work hits or when equipment breaks because it is not being maintained properly,” the meteorologist said. At NOAA's Climate Prediction Center (CPC) in Maryland, employees who provide most operational climate forecasts have stayed on the job, but those who monitor climate conditions have been furloughed. This is problematic, according to a CPC meteorologist, because the climate monitoring work is used to help make predictions. Products focused on short-term climate, such as weekly climate anomalies and storm track analyses may not be updated during the shutdown, the meteorologist said. The CPC meteorologist spoke to Climate Central on the condition of anonymity because they were not authorized to speak to the press about the shutdown. According to a spokesperson for the Commerce Department, which houses NOAA, the missions of “weather, water, and climate observing, prediction, forecast, warning, and support” will all continue despite a lapse in fiscal year 2014 appropriations. However, much of NOAA’s research activities have stopped or been slowed. For example, Harold Brooks, a top tornado researcher who works at the National Severe Storms Laboratory in Norman, Okla., reported his furlough notice on Facebook on Tuesday. 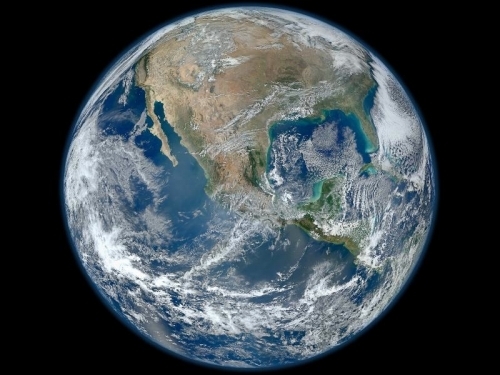 Much of the staff at NOAA's Earth Systems Research Lab and the Geophysical Fluid Dynamics Laboratory, except for positions related to maintaining computing resources, have also been furloughed. Those two labs are heavily involved in NOAA's climate research programs. “Because your services are no longer needed for orderly suspension of operations and you are not engaged in one of the excepted functions, you are being placed in a furlough status effective October 1, 2013,” said Brooks' post on Facebook. “Always a good letter to get,” he said. Two noteworthy exceptions in the research arena are computer models that are used for weather and climate forecasting and hurricane research flights. The Atlantic hurricane season ends on November 30, and although the season has been unusually quiet this year, NOAA is maintaining its readiness to fly into storms to conduct scientific research. NOAA’s fleet of weather satellites, which it operates with NASA, will continue to gather data. The longer the shutdown lasts, though, the greater the risks that it will have lasting impacts on America’s weather and climate infrastructure. For example, the country is already looking at a likely gap in critical weather satellite coverage starting in about 2016, which experts say will result in less accurate weather forecasts. 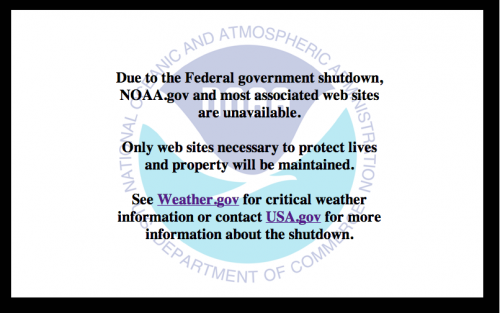 The message on the main NOAA website on October 1, the first day of the shutdown. Any further delays in developing new satellites will increase the likelihood and length of such a gap. A short shutdown will allow the contractors that are building the new satellites, including new polar-orbiting and geostationary weather satellites, to keep working using funding left over from fiscal year 2013 appropriations. But, according to NOAA, if the furloughs last beyond 1 to 2 weeks, the satellite production schedule could slip. Other government agencies that play a role in weather and climate research are not faring as well as the NWS under the shutdown. NASA, which recieves the largest share of climate science research funding under the U.S. Global Change Science Program, did not have a functioning main website as of Tuesday morning, and just 3 percent of its workforce (including the astronauts currently in space on the International Space Station) are still on the job. NASA's Landsat satellite, which scientists use for monitoring changes in Earth systems and plant health, will continue operating but its images won't be processed into a format useful for research and monitoring, according to a report in The Atlantic. 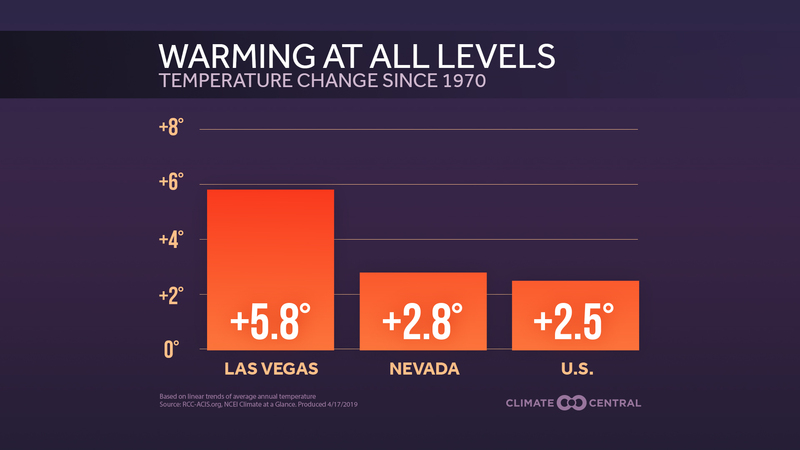 Other federal agencies that have a significant role in climate and weather research have also sharply curtailed their operations. The National Science Foundation is not offering any new research grants until the shutdown ends, and the Department of Energy will have just 1,113 employees remaining on the job, compared to its full contingent of 13,814 employees. Most of the non-furloughed Energy employees are responsible for maintaining the U.S. nuclear weapons stockpile and conducting other critical life and property protection work. The Energy Department is a key funder of climate research programs, and provides advanced computing resources at its national labs. The National Renewable Energy Laboratory is operating using funds carried over from the last fiscal year. 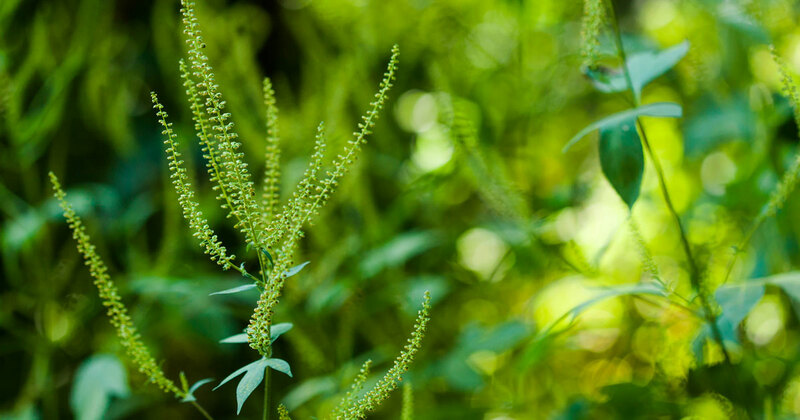 Some programs related to energy efficiency and researching advanced energy technologies, along with the Energy Information Administration, which conducts research on energy trends, have been shuttered. 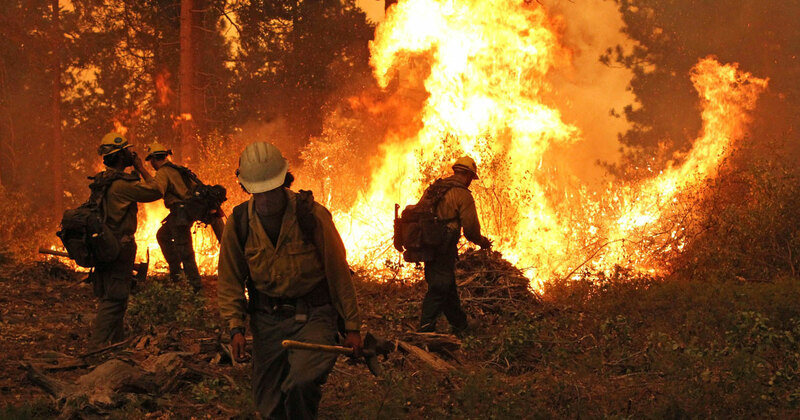 Other agencies that conduct climate research include the Department of Interior, where about 81 percent of agency employees have been furloughed. The U.S. Geological Survey is housed within the Interior Department and operates the national network of river flood gauges that help warn of dangerous flash flood events. Editor's Note: This story has been updated to indicate that the Energy Department's National Renewable Energy Laboratory remains open. The initial version of the story incorrectly stated that it had closed due to the government shutdown.